How to Videos & Care - Medico International Inc.
Before placing your order, be sure to check our our videos below. Our How to Measure video will guide you through the steps to make sure you select the perfect size garment. Then, be sure you are putting on your garments correctly by watching our how to video explaining the process. It will ensure you are get the proper fit and compression from your surgical garments. Medico Compression Wear is constructed with technical fabrics designed to feel good while aiding in recovery and offering support and shaping. Be sure to follow the care instructions to ensure you get the most from your purchase. What is the best way to launder my Medico Compression Wear? 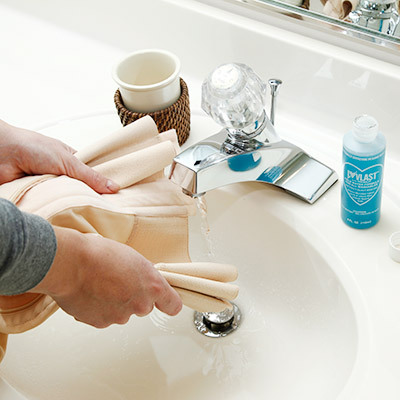 The least damaging way to care for your compression wear is to hand wash. We recommend that you hand wash your compression garment in lukewarm water with a mild detergent and then air dry. Please do not dry your garment in a gas or electric dryer, for it may ruin the garment. Drip dry, do not wring out. Delicate or synthetic fabrics tend to dry quite quickly. To remove bloodstains, simply soak your garment in a basin of cool water mixed with a ¼ cup of peroxide. NO! Medico recommends that you hand wash to extend the life of your garment and avoid garment damage (i.e. straps becoming tangled by the agitator). Can my Medico Compression Wear be tumble dried? Tumble drying is never recommended. Even a low heat setting damages the stretch properties of your garment and dramatically reduces the lifespan.